A simple search with the United Kingdom Armed Forces and Conflict Records allows you to access more than 38 military and service record datasets, spanning a period from 1656 to 2005– the most comprehensive set of British military records available online. It covers the two world wars, as well conflicts such as Waterloo, Trafalgar and the Boer war, and peacetime army lists. You’ll find officers and soldiers of all ranks, and other servicemen such as RAF, Navy, Marines, and support personnel. Listed below is a selection of highlights from the military records which can provide detailed information about your ancestors. The Chelsea Pensioners' British Army Service Records 1760-1913 are brought to you online in association with The UK National Archives (TNA). These records are of men pensioned out of the British Army. The connection with 'Chelsea Pensioners' is that the pensions were administered through The Royal Hospital at Chelsea. The great majority of pensioned soldiers were out-pensioners and did not reside at the Hospital itself, which means there are many more soldiers' names listed than the name suggests. The Militia was a voluntary, county-based, part-time force for home defense, and many of its soldiers went on to join the regular army. As well as fighting in the militia, its men held down regular jobs so these records are very useful for finding out how your ancestors were employed. There is also detailed information about achievements made while in the service. The Militia Service Records 1806-1915 are brought to you online in association with The UK National Archives (TNA). The TNA record series number is 'WO96': WO indicates that the records were created by the War Office, the precursor of today's Ministry of Defense. The names of 661,960 other ranks are included within Soldiers Died in the Great War, otherwise known as World War I. This military history records collection covers military deaths within the period from August 4, 1914 (the declaration of war) to November 11, 1918 (Armistice Day), and in some but not all cases, up to March 25, 1921. Soldiers Died in the Great War 1914-1919 was originally published by His Majesty’s Stationery Office (HMSO) in 1921. It was published in 80 parts. Most parts covered a single regiment, subdivided into its various battalions. However, some parts covered groups of credits such as the cavalry, smaller infantry regiments or other corps. One of the most sought-after sets of reference books of the First World War is the National Roll of the Great War. 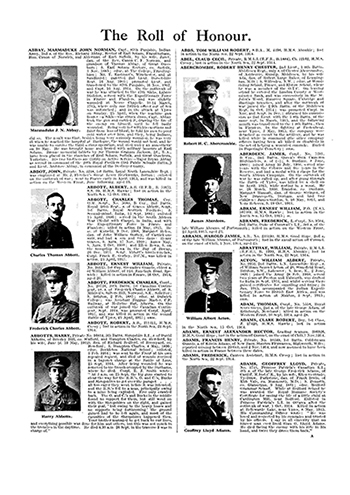 The National Publishing Company attempted, shortly after hostilities ceased, to compile a brief biography of as many participants in the War as possible. The vast majority of entries refer to combatants who survived World War I, and the National Roll is often the only source of information available. Fourteen volumes were completed on a regional basis. This British military service index database on findmypast.com now allows simple searching of this unique World War I reference source. Originally published in five volumes, Marquis De Ruvigny's Roll Of Honour features biographies of more than 26,000 Army, Navy and Air Force men (both officers and other ranks) killed in the Great War. This World War I records collection features 7,000 transcripts which include photographs. The notion of an all-encompassing biographical listing of each serviceman killed in the Great War, at the war's outset, would have seemed perfectly feasible. In the early months a quick, easy victory was expected, and would-be soldiers volunteered in their droves. It quickly became clear, however, that the war would be long-lasting; the disasters of 1916 and 1917 making those early months of patriotic optimism seem a distant memory. By then it was perfectly clear that the De Ruvigny's Roll Of Honour’s ambitions were entirely unachievable. Nonetheless, this roll offers a unique glimpse at over 26,000 men who gave their lives, and stands as a tribute both to the men themselves and the perseverance of the roll’s compilers.